I just got back from a trip to my hometown of Toronto, Canada. My family and I were visiting old friends and relatives and we had a great time rehashing old stories. While up in Toronto, the Mats Sundin Watch was still a huge topic for the hockey obsessed people of Toronto (not my words, Sean Avery's words, to be exact)... Avery's not far from the truth, I will admit. I personally don't understand the fury it has caused (waiting on Sundin's decision). He's a very good player, but as I've said before; he's not Wayne Gretzky, Bobby Orr, Mario Lemieux, Etc... I could go on and on but enough is enough. The NHL and college hockey season openers are right around the corner. I really am looking forward to this year. 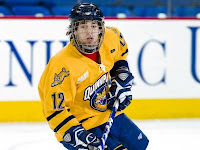 I will be the color analyst for the Quinnipiac Bobcats of the ECAC along with my good friend (and voice of the Bobcats), Bill Schweizer, as well as Don Boyle. I had a fantastic time doing radio for the Bobcats last year and this year should be even better. If you are in the area of Hamden Connecticut, check the Bobcats hockey team out... you will not be disappointed! It's a great university and they play in a highly competitive league of Division 1 hockey. Hard to argue with these selections, the fans were dead on with their choices. I would like to see a 20 man roster chosen by the fans as well, though. I know that Harry Howell and Ron Greschner were 3 and 4 in the voting for defense. And what about the other 3 lines of forwards? Hadfield, Vickers, Etc.? Let me know what you think. I am very interested to find out! Other Ranger news... the dates are set! Adam Graves' jersey induction is February 3rd and the fans get a 2 for 1 with Harry Howell and Andy Bathgate on the same night on February 22nd. Tickets to these nights will be tough to get a hold of, so get cracking on them now or you will be shut-out! One last thing, my question to Ranger fans: Mats Sundin joining the Rangers... yes or no? Looking forward to your responses. Over and out! I just received my New York Ranger Alumni Summer Newsletter and the Adam Graves Jersey Retirement Night section really caught my eye. Adam Graves, for those who know him or don't know him, is one of the most honest & genuine gentleman you will ever have the pleasure to meet. I played against Adam and with him when he was in Detroit (Albeit 2 games). His play was tenacious and determined. I knew when he was on the ice, there would be no time to take it easy. His style was one of a skilled, yet physical player that kept you honest. 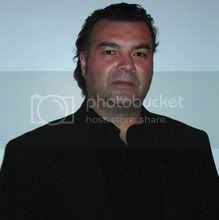 Congratulations go's out to Mr. Graves for who he is and what he means to the Rangers and fans around the league. I'd also like to congratulate Andy Bathgate and Harry Howell, they too will be honored by the Rangers sometime in the 2008-2009 season. I really love these choices because they too were true legends of the golden age of hockey. I grew up in Toronto when the NHL existed with the original 6 teams. I watched every team play whether it was the Rangers, Leafs, Canadiens, Blackhawks, Red Wings, or the Bruins. 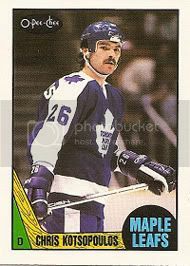 With players like Bathgate & Howell visiting the Leafs to play on the historic "Hockey Night in Canada", youngsters all across Canada were in high adulation of these players. They were/are heroes and the reason every kid in Canada wanted to play the game hockey. 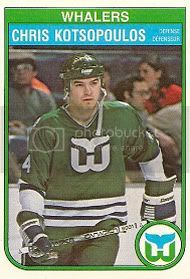 They played a big part in my dreams of playing in the NHL as well as the following players (and you will have to excuse me for being nostalgic here); Bobby Hull, Gordie Howe, Bobby Orr, Dave Keon and many more players. I could go on forever about this, but I'll stop here. Congratulations to Andy Bathgate & Harry Howell. 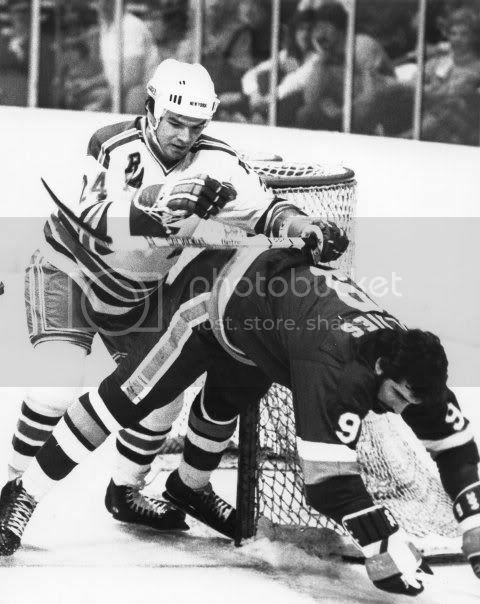 Your time has come and you both are true Ranger legends (Could Ron Greschner be next? He should be)! It's funny, because at Ron Greschner's golf outing, I had the great pleasure to sit and talk with another Ranger legend: Vic Hadfield. He mentioned Bathgate and Howell as candidates for jersey retirement. Vic, you're getting your wish! 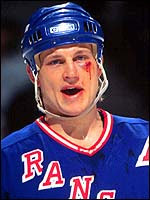 I'll leave you with this: Enjoy the present day players of the NHL, but please don't ever forget about the past. Over and out! Well, it's definitely a slow time for me with no hockey. I just about had enough of baseball (boring)! As I was checking out other sites, I came across a story on the Blueshirt Bulletin that totally took me by surprise. 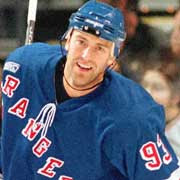 Yes Ranger fans, there's been a Petr Nedved sighting and he's coming to a Ranger training camp near you! Where do I begin with this revelation? Yeah, we know he's been a Ranger before. He's a nice guy and all that. But, really, what makes anyone believe he has any gas left in the tank to give the NHL one more try (at 36 years old)? Sure, he'd love it if he could find a spot on the Rangers roster... I mean, who wouldn't? However, Nedved himself is a realist and knows that it is a bit of a longshot for him to survive final cuts. 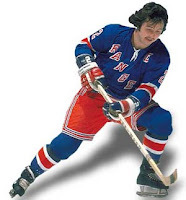 I guess the "No Guarantee" that Glen Sather has communicated to Nedved basically gives him the green light to attempt a comeback, where the Rangers are not at all on the hook money wise. All I can say is Good Luck to Nedved and I wish him well. Another thing that's really getting out of hand is the "Mats Sundin Sweepstakes". As I've said before, I understand that Sundin is a future Hall of Famer, but what gives him the right to hold NHL teams at ransom? Never has an NHL player been allowed the courtesy, time, and effort (not even Wayne Gretzky) that teams have given Sundin so he could hum & haw about playing this upcoming season. And all this for who? Yes, he's still a very good player and will definitely help somebody, but please... Sundin is not bigger than the league itself. 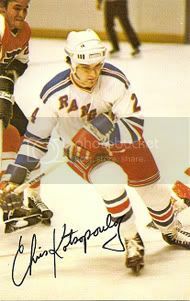 I'll leave you all with this one, much like my with my last blog entry... Who is the all time Rangers penalty minutes king? The answer might surprise you! Over and out!